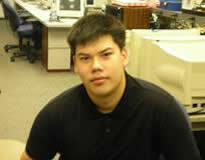 Since completing Akamai, Darcy earned a master’s in electrical engineering from University of Hawaii, Manoa. There are over 8,000 man-made objects in space, including operational satellites from as many as 45 different countries. It has become necessary to be aware of what exactly is orbiting Earth and where these objects are located at any given time. For this project, I have assembled and configured a complete small telescope system that will be able to autonomously locate and track satellites, and determine their exact position in space. In order to prepare one of these systems for future deployment, this project included completely integrating a small telescope system and bringing it up to a fully autonomous operational state. Integration included the assembly of a computer system, weather sensor assembly, and telescope assembly. Upon completion of system integration, a mount model was performed, which also included polar alignment. Once the robotic telescope mount software had an accurate map of the sky, task scheduling and scripts were configured so the system could operate in an autonomous state. Final results included accurate, autonomous tracking and imaging of satellites, and showed that the system was ready for further intensive pre-deployment testing.